Aghalee, and Moira Railway took place in December 1958, following complaints from a resident. The investigation was carried out by Ministry of Commerce officials together with officials of the Lisburn Rural Council. The complaint was revealed at a meeting of Lisburn Rural Council when the divisional sanitary officer outlined a complaint from an Aghalee resident about an offensive smell at the Lagan Canal. A series of samples were taken for investigation from the inspection. LISBURN United carried the borough's flag into Youth Cup combat as 1985 came to an end, when they would confront Ards in the showpiece final which was due to be played under the floodlights at Sydenham's junior stadium, the Star reported. United's hopes were pinned on a striker fighting off a painful ligament injury. Coach Stanley Dewart admitted to being worried about Glenn Hunters lack of progress and warned: "He's a long way f from 100 percent fitness." Dewart added: "You depend 1 a lot on a striker who has 26 goals to his credit this season." A HILLSBOROUGH art teacher had little idea what was in store when she painted portraits of her family four years earlier, the Star reported in December 1985. Little did the local woman know, that her art would be exhibited in homes across the Province. The Hillsborough woman was spending any of her spare time painting, with orders coming in from as far away as Donegal. This photo of Lambeg Cricket Club has been brought to us by Star reader Norman McMaster. 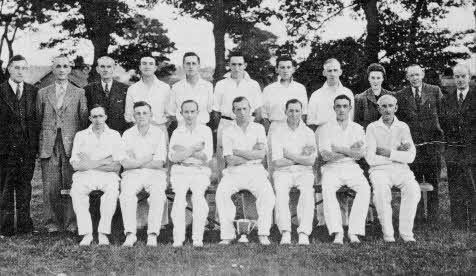 Taken at Lambeg Cricket ground in July 1945, it shows the team who were Centenary Cup Winners that year. Back row, from left to right are: J. Jones, W. Irvine, T. Agnew, R. Cathcart, R. Morrison, R Mcilroy, N. McMaster, J. Black, E. Morrison, W. McCullough and T. Robinson. Front row, from left to right are: R. Thompson, J. Chapman, T. Hopkins, T. Totten (Capt), W. McClenaghan, S. Magee and T. Maguire (Groundsman). LISBURN'S lonely were not forgotten at Christmas in 1966. Indeed for many of the town's aged, that Christmas would be one they would not forget easily. It was all thanks to the tireless efforts of the Lisburn Community Service Committee, and in particular, the Meals on Wheels service. Set up six years before, the service was now spearheaded by go-ahead Mrs Sarah Crothers, a member of Lisburn Borough Council and a welfare worker extraordinary. The week of Christmas saw 157 old folk - many unable to fend for themselves - being treated to a 'free meal'. And it certainly was a meal with a difference. There was roast pork and Christmas pudding, apples and oranges - indeed just about everything. Dinners were also served to residents of Abbeyfield Houses in town and the temperance Institute Old Men's Club and to Gregg Street Old men's Club. At that time the meals on wheels service operated two days a week on Mondays and Thursdays. Efforts to have the service extended had failed, however, the Star reported that it wasn't actually a demanding job, with only three hours one day every fortnight required and local people were being encouraged to volunteer. THE sharp rise in the number of car thefts in the few days leading up to Christmas in 1969 was being viewed with deep concern by local police chiefs. A total of seven cars were taken the previous weekend and in some cases the thieves broke into garages while the owners slept. One of the cars was completely burned out due to wire crossing. Police had then issued an appeal to car owners. They declared:- "Ensure that cars are properly secured or immobilised when unattended." One big failing on the part of motorists was to leave the car unlocked while unattended. In one case a car was taken from the car park outside Lisburn Technical College. Those responsible broke the quarter light window to get the car door open, the Star reported. Fancy a London Winter Break for two nights including flight for £16.60? 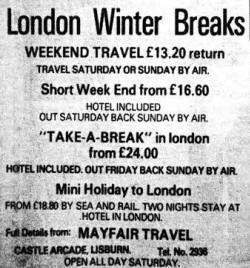 It was on offer way back in the 70's at Lisburn's Mayfair Travel. A police spokesman appealed to motorists to ensure that vehicles were immobilised when not in use. He asked drivers not to leave the keys in the ignition when the cars were in the garage even if the garage was locked. In some cases it is easy to break into a garage, the police said, and when the keys were in the car's ignition it made it even easier for thieves. In the course of checks on vehicles in the town at the time, police had found that some owners still parked their car and left it unlocked. The police spokesman stressed: "Motorists cannot be too careful with their cars and should always be on their guard against thieves. In some cases a lot of trouble could have been avoided had simple precautions been taken. "Anti-theft devices are available and can be easily fitted to cars for a reasonable cost and it could save hundreds of pounds and needless worry for car owners." 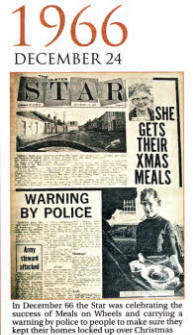 A TERRORIST bomb ripped the heart out of Christmas and New Year for hundreds of Lisburn people, the Star reported in December 1972. The sad news followed a blast which wrecked the Beechlawn Hotel. The hotel had been fully booked for the festive season, but had since been closed. The dining room escaped damage, but the function room and bar were demolished. The hotel was full of people when three men, two of whom were armed, arrived and planted the bomb, telling staff they had fifteen minutes to evacuate the building. The men drove off and the hotel was evacuated before the bomb exploded. No one was injured.